Quietly flying under the radar in the fitness wearables market is Whoop, a manufacturer of high-end wrist-worn straps that measure data 100 times per second. In what could turn out to be one of the more bizarre licensing agreements ever, the startup struck a deal with the NFL Players Association today that will make it possible for players to sell their health data. At its most basic level, the agreement paves the way for Whoop to sell licensed player-designed wristbands for its $500 Whoop Strap 2.o but that’s the least interesting part. The players who decide to participate in the program will own all of the health data that Whoop collects and the NFLPA sees this as another monetizable part of the game. “Every day, NFL players produce data that can translate into physiological and financial opportunities. We see partnering with WHOOP as the first step in harnessing this exciting technology,” Ahmad Nassar, President of NFL Players Inc. said in a statement. Whoop is positioning itself as an elite fitness tracker and has been working with college and professional sports teams to build its brand and test its products. Our sister site Deadspin recently profiled the exploitative ways that Whoop has worked its way through college sports and the privacy concerns that are involved in those deals. 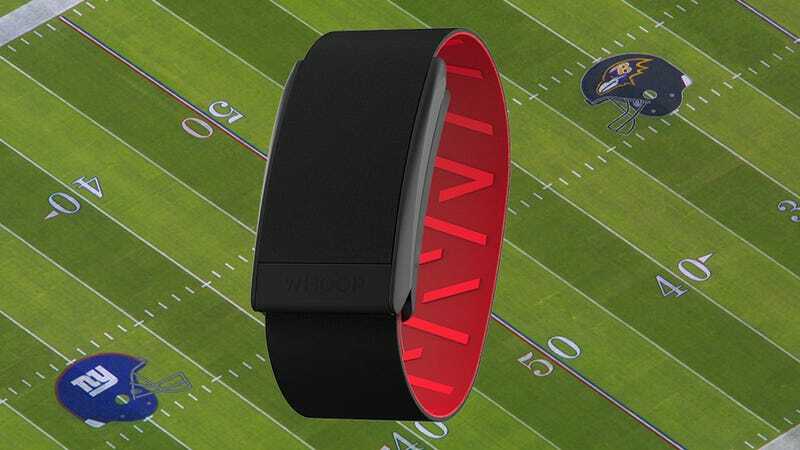 For Whoop, the NFL deal means that they have the highest of high-profile partners to offer endorsements but they’ll also be collecting fitness data from people who push their bodies to the extreme. The company concerns itself with personal recovery and encourages its customers to wear the device 24/7. In the world of big data, this is a biological goldmine. Whoop is collecting medical recovery stats for practically every injury under the sun as well as workout data from people who workout constantly. Picture this: A television network during an NFL broadcast comparing the heart rates of star players doing the same workout — or while they sleep. Say Tom Brady versus Cam Newton. Now picture being able to determine which player’s body was better prepared to play. Oof. That takes a little bit of the fun out of speculating about a team and the season. Of course, football is a stat heavy game and this could just throw a lot more stats at the fans who love to parse them. Imagine a dedicated ticker on your favorite website that shows the current health data of a sidelined running back who could make or break a team’s season. Imagine shady deals occurring that give a backchannel peak at player’s data for the purposes of organized gambling. Imagine a little graphic of a heart at the bottom of your screen pumping faster as two players get into a screaming match. And eventually, imagine teams contractually requiring these things be worn at all times and scandalous disputes breaking out when a player ditches his for a coke-fueled weekend. The future is a lot more strange and a lot less fun than we hoped.